I’m a mom—a mom with two beautiful girls and a wonderful husband. I work full-time in a job I mostly love in higher education where possibilities seem endless. I am surrounded by people who are passionate and creative. It’s inspiring to be in that environment and makes you want to contribute to a world of knowledge yourself. I’ve always been the quiet type and was never one to claim the center of attention so writing this seems a bit foreign to me. Being a mom has changed me in so many wonderful ways. Perhaps one of the most dominant is the desire to create. I had to laugh when the weekend we told my parents about my second pregnancy, my mom’s first reaction was “I knew it!” I had been sewing a lot and posting pictures of my projects on facebook and before I even knew I was pregnant my mom had the inkling that my “creation spirit” was working. At first I thought she was crazy (because isn’t it a requirement of children to think their parents are crazy?) but reflecting back on it now, I get it. Women are called to create and contribute. Perhaps that’s why there are so darn many mommy blogs out there. We each need our little corner of the universe. Our own place to share. A place to create. A place to brag. A place to interact. So what am I going to share? I’m a DIYer at heart. I love to sew. I love to cook. I love to make my home a welcoming place. I’m constantly on a path of self-improvement. I love to try new things (like blogging)! As I venture through these new ideas, I would like to share them with you. I will post once at least one a week—whatever I’m up to. I hope I’ll inspire you with some ideas. I hope you’ll interact with me. I hope you’ll comment and share thoughts and make suggestions. 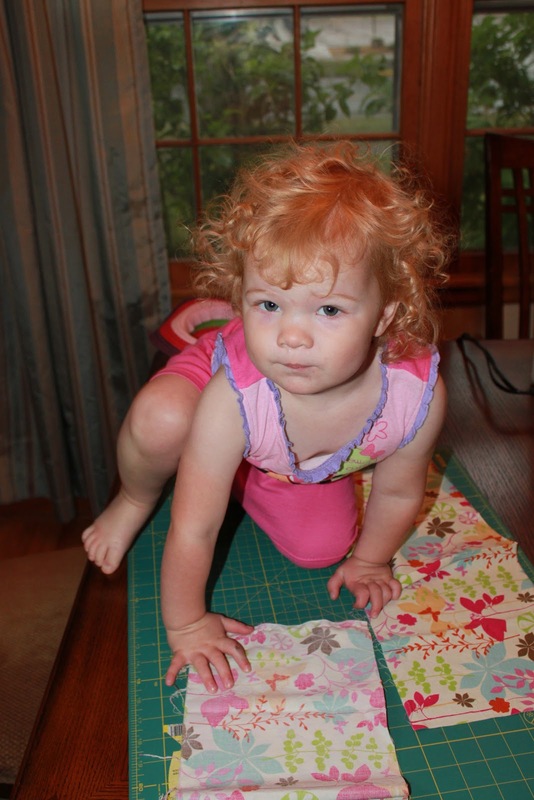 My ever so (not hepful) helper Curly Girl--crazy curls and always good for a a laugh. So true! Or should I say "sew true"?! I actually sewed a curtain and made 2 wall hangings during my labor with baby #3:). Loving the blog Nina! You are very talented and creative.